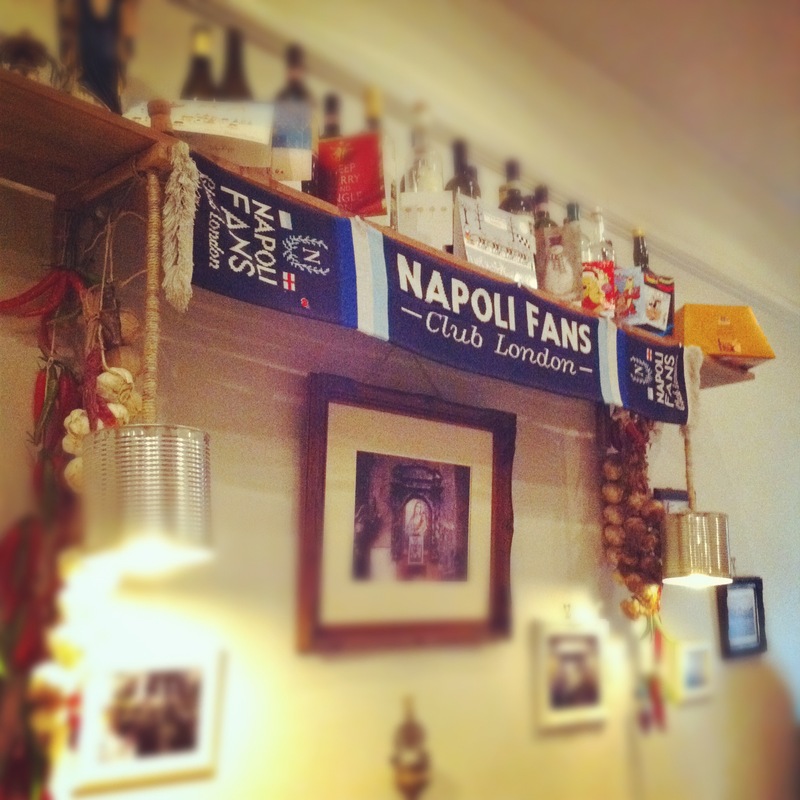 “Naples is a thousand colours, Naples is a thousand fears… Naples is a piece of rubbish, that no-one cares about”. Pino Daniele’s melancholy ode to his beloved Naples captures the reason why most people eschew it for the dolce vita of Rome, serene romance of Venice or chocolate-box perfection of Florence when planning an Italian citybreak. The tragic death of eponymous Greek siren Parthenope, in the bay, characterises the city’s infamous combination of beauty and danger: Naples is a raw, sultry femme-fatale, to Florence’s pristine, blanched prettiness. But this seductive UNESCO World Heritage site wakes you up, and assaults your senses with its outdoor theatre: it is not to be missed. The fertile volcanic soils and abundant agriculture gives us bounty like sweet piennolo cherry tomatoes from Vesuvius, San Marzano tomatoes, peppery friarielli, and aromatic, fat Amalfi lemons. It’s also the spiritual home of dried pasta, dating back to the 16th century when Neapolitans had to devise a way to store grain during times of famine: the sunny, windy climate being perfect drying conditions. Today, Neapolitans are known as “mangiamaccheroni” (macaroni eaters) by other Italians for their insatiable appetite for pasta, and their cuisine has been dispersed globally because of mass post-unification emigration. Arriving in Piazza Garibaldi is far from an auspicious welcome – more reminiscent of Dante’s Inferno than Goethe’s paradise – but dodge the hawkers and hurry through the Camorra hinterlands of Forcella to Da Michele, one of the most celebrated pizzerias in Naples. Neapolitans don’t do orderly queues so you’ll likely find a throng of locals outside at midday. Take a numbered ticket and await your turn. The clientele is a mixed bag of locals and bewildered tourists, thanks to being popularised in the film Eat, Love, Pray. No matter, the pizzas are still supreme. The choice is simply a Marinara or a Margherita (there are two sizes and a double mozzarella option). These are gloriously thin, floppy-centred pizzas: almost impossible to eat by hand, though the cornicione crust is perhaps softer than elsewhere. If you can’t be bothered to queue, try Trianon opposite. It’s been around since 1923 and is much bigger. La Notizia has a stellar reputationand is in a posher part of town. Run by Enzo Cocchia, it has an extensive menu ranging from traditional pizzas to calzone stuffed with cigoli (crispy pieces left behind from rendering pork fat) or even truffles. Finish off with a Nutella saltimbocca. Back in the old town, head to Via Tribunali, one of the oldest streets slicing Naples in two; hence the name Spaccanapoli. This is the Naples of legend – laundry strewn between tenements, gents idling in doorways, guagliune tearing through on scooters, their guttural, raspy dialect reverberating in small alleyways. Feast on visual delights such as Caravaggio’s ‘Seven Acts of Mercy’ or the faded San Lorenzo Maggiore church sitting atop Roman ruins. Fishmongers spew out on to the street, with plastic trays filled to the brim with stripy lupini (clams). Giant scarlet sausages studded with rich pork fat hang in windows, and bowls of the freshest, pillowy mozzarella di bufala sit beside pear-shaped scamorza. At the end of Via Tribunali, the oldest pizzeria in Naples Antica Pizzeria Port’Alba, juxtaposes the youthful La Stanza del Gusto. Here chef Mario Avallone innovates on traditional Campanian cuisine with dishes such as salt cod in tempura, and roast buffalo with beetroots in a colourful, eclectic interior. There’s also a cheesebar and fine selection of salumi if you simply fancy snacking. Neapolitans excel at patisserie, and two places are renowned for local specialities. On Piazza San Domenico Maggiore is Scaturchio, the oldest pastry shop in Naples (opened 1905). Try baba – a rum-soaked cake, often filled with fruit, Nutella or cream, or zeppole di San Giuseppe – these glorious fried or baked choux rings, traditionally eaten on 19th March (St Joseph’s day), are topped with lemon pastry cream and cherries. For the best sfogliatelle in Naples, head to Pintauro on Via Toledo, where they’re served warm from the oven. These beautiful confections stuffed with sweet ricotta, candied citrus, and a pinch of cinnamon come either riccia (with a crispy, twisted shell) or frolla (a softer, shortcrust shell). For savoury treats, Bar Luise (just opposite Galleria Umberto or in swanky Chiaia) makes sfogliatelle stuffed with a typical Neapolitan combination of sausage and friarielli. Or try gattò di patate and escarole pie. Take the funicular up to the Vomero to Friggitoria Vomero to sample an array of fried snacks such as crocché (potato fritters with ham or cheese), panzerotti (filled pastries) or ciurilli (zucchini flowers). Finish with a coffee and people watching at the elegant Art Nouveau Gambrinus and the best gelato from Gay Odin. For a more glamorous sojourn, I recommend spending the night on Capri for dinner under a canopy of lemon trees at Da Paolino. Loved by locals and celebrities alike (Tony Bennett was there on my last visit), the antipasti buffet is an enormous cornucopia of Neapolitan specialities. Also try the ravioli caprese. Capri is best enjoyed once the daytrippers have departed, but two excellent lunch options away from the crowds include Le Grottelle, on a terrace overlooking the sea by the Natural Arch, where the spaghetti with baby squid are particularly good; or La Savardina, up towards the Villa Jovis, where you can eat fabulous linguine al limone and local fish, pezzogna, under orange trees. Stay at Hotel Luna overlooking the fariglioni, or the chic Capri Palace with its 2* Olivo restaurant. Don’t believe the rumours about Naples and its ubiquitous tales of petty crime and decay. Naples is like any other European city in its blend of urban life. Unlike any other European city or any other place in the world, Naples has pizza – the ”noblest, most genial and most noteworthy of Naples’ institutions”. Pino should have sung about the food instead. Since, by a cruel turn of circumstance, I came to be living alone, I’ve lost much of the pleasure I used to derive from cooking. Food had always meant more to me than just nourishment ever since I witnessed the sheer happiness that my father drew from cooking for me once he had retired. He’d bug me at work, asking what I fancied for dinner. Invariably I couldn’t decide so he’d sometimes make a few things. Yep, I was totally spoilt, but he loved doing it, and slowly it rubbed off on me. The joy gained from feeding someone you love, and sharing a meal with them, can be truly infectious and lift the spirits. Conversely, cooking for one leaves me feeling thoroughly flat. I’ve also lost an enormous amount of confidence, such that following recipes and inevitably being constrained by the requisite precision that cooking a new dish or unfamiliar cuisine demands can seem too daunting at times. Cookery books languish on my shelves untouched, unloved, and pristine. I’ve therefore wound up cooking a limited and repetitive, yet comfortingly familiar, diet of pasta and other simple meals. And indeed, whilst the possibilities for variety with pasta are endless, I invariably make the same two or three sauces that habit, and lack of forethought, dictates. I originally started the blog with the intention of compelling myself to broaden my knowledge and repertoire of Italian food: in particular, that of Campania, and its principal city Naples, where my father was from. However, since my inaugural post about pizza, I’ve struggled to find the inspiration to continue. Nevertheless, following some rather delightful feedback via Twitter from a couple of well-regarded food folk concerning that post, I feel newly encouraged to put pen to paper. It seems pertinent, then, given my current torpor, to also use the blog as a means to drag myself out of this food rut that I’ve sunk into, and try some new, Neapolitan dishes at home. With an impending trip back to the Fatherland, it seemed fitting to test out a dish that I ate on my first ever visit there, aged seven: ‘Capretto con piselli e uova’. 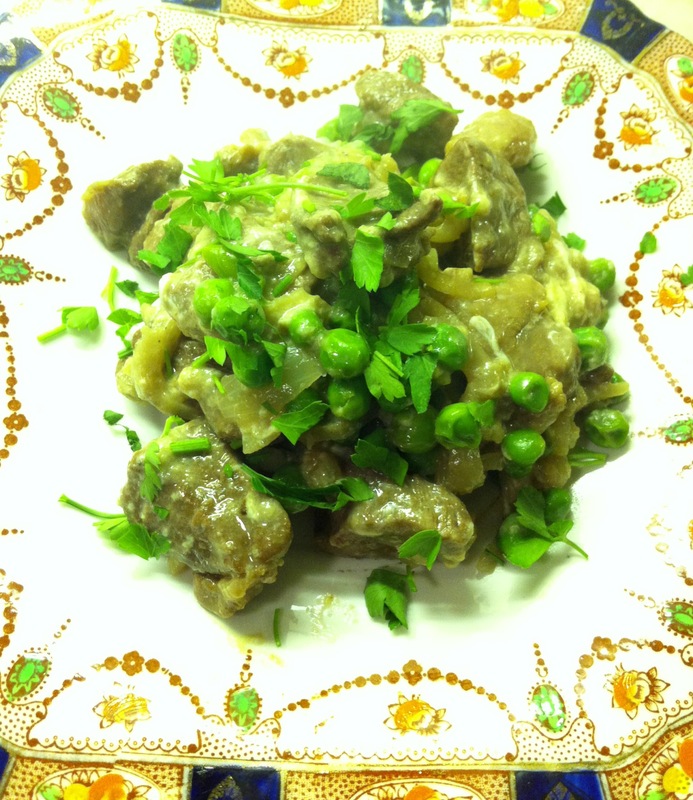 That’s kid goat* with peas and egg. Neapolitans typically eat this on Easter Sunday. I hope you like it. Liberally cover the bottom of a frying pan with olive oil and gently fry the onion until soft, but not coloured. 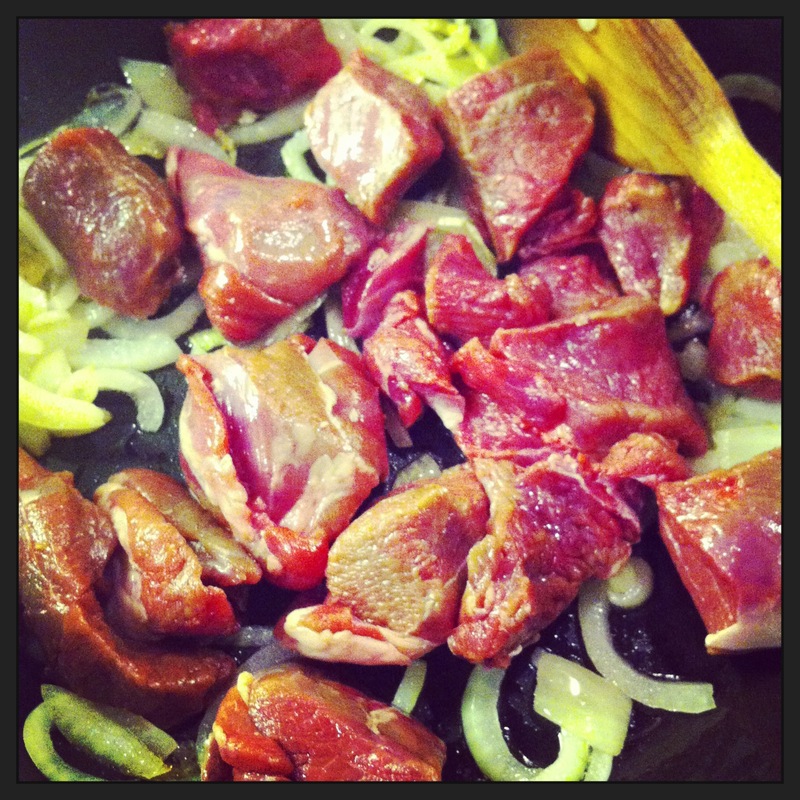 Next, add the goat to the pan, and cook over a medium heat until browned, turning frequently. Season with salt and pour in the wine. Lower the flame and let the meat cook gently, uncovered, until the wine has bubbled away and reduced to a lightly syrupy consistency. You may need to add a little water from time to time to ensure that there is always some liquid to the dish. This process should take around 30 minutes, but use your judgement. Stir in the peas, still frozen, and cook for a further five to ten minutes, until they are cooked through but still bright green. Try not to crush them. In the meantime, beat the egg and combine with the grated cheese. Once the goat and peas are cooked, remove the pan from the heat and stir in the eggy-cheese mixture. The eggs should cook into a creamy emulsion using the residual heat from the meat. This would also be wonderful with some beautiful baby artichokes or freshly podded broad beans; especially now that Spring will soon be here. And of course, you can substitute the kid goat for lamb should you wish. Kid goat is eaten widely in Italy, though not so much over here and it’s a great shame for both ethical and nutritional reasons. Baby goats tend to be raised as a by-product of the dairy industry, rather than being bred for meat (the female goats must give birth regularly in order to lactate). Inevitably, this means, as with male dairy calves, that baby billy goats are sent to slaughter since they can’t be used in the dairy industry. Cabrito, founded by chef James Whetlor and farmer Jack Jennings, is hoping to change this by supplying quality goat meat to restaurants. They don’t breed goats for meat; rather they raise those born as a by-product of the dairy industry, and only take goats from farms with high welfare standards. Currently, Cabrito is supplying restaurants such as Quo Vadis, St John, 10 Greek Street and Bocca di Lupo. You can also purchase their meat from Flock & Herd ** butchers in Peckham, which is where I got mine. In terms of nutrition (see below), goat is an excellent health choice, containing less fat than chicken, and more iron than beef. It’s also very high in potassium, which is good for balancing out the negative effects of salt in our diet. ** I’m not sure Flock & Herd still stocks goat meat, but you can now buy the goat meat from The Ginger Pig and The Quality Chop House. One of the perils of living in the arse end of nowhere, at the end of the Northern Line, is the interminably long tube journey home. 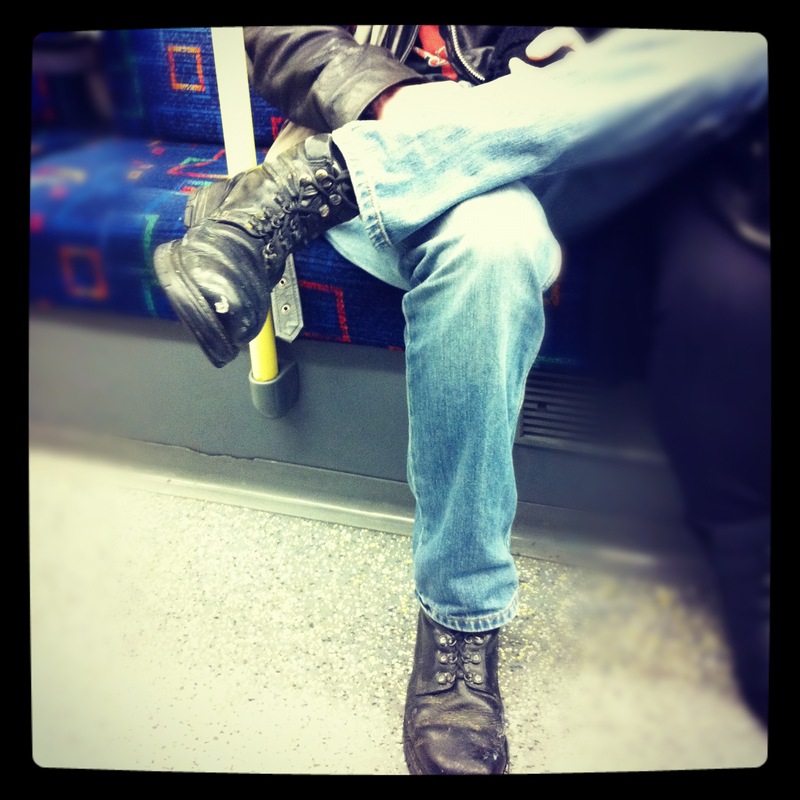 When I’m not surreptitiously snapping #sleepclub shots, or documenting crimes against commuter fashion, invariably I fall prey to all manner of aural assaults: the loud footie bore, the slack-jawed gum-chewer, or the self-proclaimed font of all knowledge. Recently, during an almost two hour trek home from Santa Maria pizzeria in Ealing, I suffered the misfortune of sitting right across from the latter. I watched with mild intrigue as he proudly showed his girlfriend the vast Iron Maiden badge collection on his jacket, and waxed lyrical on his various specialist subjects. He was a bore. And a loud one at that. And then came the broadside: “I hate Italians”. My mind boggled at what could have caused such a vituperative declaration (but I remained calm), and then came the reason. “They think they invented pizza, but they didn’t, the New Yorkers did”. And this got me thinking. Was he right? Being a half-breed mongrel Neapolitan, I’d always believed that pizza was invented in Naples, its spiritual home; but perhaps that was an urban myth. Even several Twitterati reiterated the New York story. Time to find out. It transpires that the common consensus surrounding the arrival of pizza in the US coincides with the influx of Italian immigrants in the late 19th century, debunking Tube-man’s myth. The first pizzeria in New York, Lombardi’s, was rumoured to open some years later in 1905. So what of its real origins? In terms of the bread part of pizza, these go back centuries and likely emanate from the Middle East where the Egyptians first discovered how to regulate yeast fermentation in order to produce leavened bread. In ‘Classic Cuisine of the Italian Jews’, it is suggested that the Jews then brought the flat bread concept to Italy in the 1st century, following the Roman conquest of Judea. In fact, the first written reference to ‘pizza’ can be found in the Latin text of Gaeta’s city charter as early as 997 AD, where it is documented that the tenant of a windmill was to give his landlord “duodecim pizze” (12 pizzas) every Christmas Day and Easter Sunday. Pizza in its current-day, tomato-topped incarnation did not of course exist prior to the arrival of tomatoes in Italy following their South American discovery in 1492 by Cristopher Columbus (or was it Cortés who brought them to Europe?). Professor Carlo Mangoni from the University of Naples believes that tomatoes were first used on pizza in 1760, and Ferdinand, King of Naples (who reigned from 1759 – 1825) so enjoyed this new pizza adorned with tomatoes, garlic, oil and oregano (the ‘Marinara’) that he commissioned an outdoor, purpose-built oven at his Capodimonte palace. Henceforth, pizza parties became the fashionable way to entertain. Even Alexandre Dumas in his 1843 work ‘Il Corricolo’ observed “…it is a complex dish. Pizza flavoured with oil, lard, tallow, cheese, tomato, or anchovies”. Around that time, the Port’Alba pizzeria opened in Naples in 1830 (having been established as a stall serving peddlars in 1738), and exists to this current day. It is another Naples institution, however, that transformed pizza into the classic ‘Margherita’. Following its unification in 1860, Queen Margherita, wife of King Umberto I, expressed an interest in Neapolitan pizza and summoned Raffaele Esposito of Pizzeria di Pietro (now Brandi) to bring her one. He decorated the traditional ‘Marinara’ with mozzarella and basil in homage to the new Kingdom of Italy and its ‘tricolore’ flag, and thus was born the ‘Margherita’. 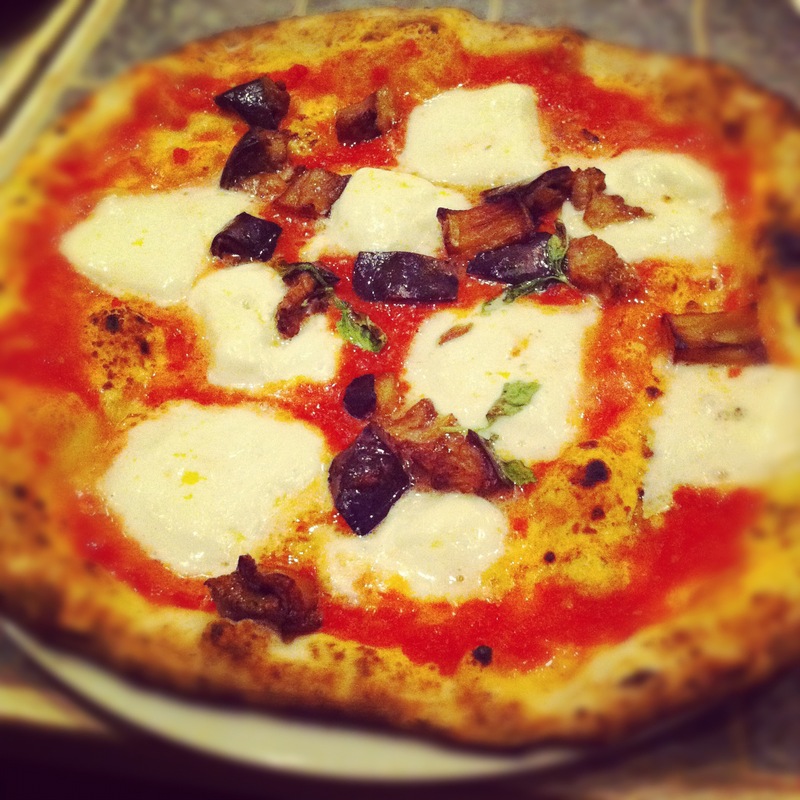 So there you have it: a potted history of the Neapolitan pizza. There are of course variations on a theme, one such being the Roman ‘pizza al taglio’ where the topping reigns supreme, the base crisp and the pizza served from trays by the slice. Or Chicago style pizza. And of course, much derided incarnations such as Pizza Express and Domino’s. Whilst these bear no resemblance to Neapolitan pizza, they say imitation is the sincerest form of flattery. And who am I to say what anyone should eat? In fact, I must confess to the occasional dirty indulgence of a Domino’s, especially cold, for breakfast. Neapolitans would of course shudder at that last suggestion, and in order to protect the ‘invention’ of which they remain fiercely proud, the Associazione Verace Pizza Napoletana was created. In typical triumphalist Neapolitan style, this not-for-profit organisation was founded in 1984 with the aim of promoting and ‘protecting’ “La vera pizza Napoletana” (true Neapolitan pizza). To achieve this, a set of exacting International regulations was drawn up governing the ingredients and production methods used in authentic Neapolitan pizza. Should you so desire, you can get the full Monty here. The dough should be left to rise for two hours, before being cut and shaped into balls (‘panetti’) by hand – the ‘staglio a mano’. The panetti are then left to rise in special boxes (‘mattarelle’) for a further four to six hours – to be used in the next six hours. I visited Santa Maria pizzeria in Ealing twice recently: once as a guest, and the second time as a paying customer. Apart from perhaps Franco Manca in Brixton, I had yet to find a pizzeria remotely resembling the kind I was used to in Naples; so needless to say, on my first visit, I was intrigued. It’s been covered by far more eloquent bloggers elsewhere (see Tehbus, Rocket & Squash and Federilli’s Pasta Bites) so I’ll keep it briefer than brief. From the moment I walked in I knew I was on to a winner: that unmistakeable aroma of tomatoes and pizza, and the decor (tiny space, white marble counter, glass fronted shelves stacked with condiments, domed oven and Napoli football team paraphernalia adorning the walls) instantly transported me back to the Trianon in Naples where my father took me as a child. The pizzas were superlative: slightly charred base, puffy cornicione with floury to-the-touch feel, soft, molten interior and delightful aroma: just as you would expect a Neapolitan pizza to be. Suffice to say, I was prepared to make the three hour roundtrip to eat there and plan on returning soon. I’d even wager that my ultra-fussy Neapolitan cousins would approve – and that’s saying something. Question is: would Tube-man? A city and commune in Lazio, 80km from Naples. Welcome to my blog. I hope to share with you my kitchen capers, musings on food and any epicurean adventures I stumble upon. Copyright © 2012 The Chaotic Cook. Unauthorised use and/or duplication of this material without express and written permission from this blog’s author and/or owner is strictly prohibited. Excerpts and links may be used, provided that full and clear credit is given to ‘The Chaotic Cook’ with appropriate and specific direction to the original content.